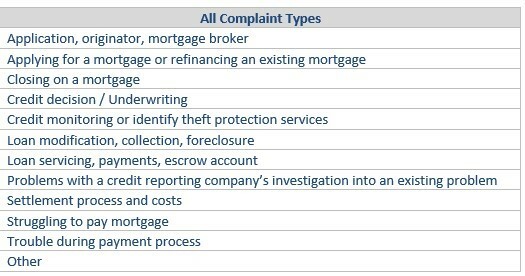 The latest summary of consumer complaints published by the Bureau of Consumer Financial Protection found that out of 71,000 mortgage-related grievances filed over the past two years only 867, or less than two percent, focused on reverse mortgages. The Bureau provided no commentary on reverse mortgages, other than it merely mentioned that reverse mortgage-related complaints accounted for approximately two percent of all complaints filed between 11/1/2016 to 10/31/2018. The report mentions a handful of complaints filed against Citi. This might lead one to conclude that a portion of the data has some inaccuracies since Citi is not involved in the reverse mortgage business. As you may recall, NRMLA commented to the BCFP last summer as part of its Request for Information (RFI) process that the Bureau should review and improve the manner by which it vets and verifies such complaint information prior to publishing it. Of the 867 reverse mortgage complaints, 835 were resolved and closed with an explanation.